As time goes by, it becomes harder and harder for many players to get together for a game. Real life has a nasty habit of getting in the way. Gaming online using Google hangouts, Roll20.net and the like help by eliminating the constraint that everyone has to be in the same geography, but they still mean that everyone has to be free at the same time. Storium is different. It is an asynchronous story telling role playing game. Whether you are a player or the narrator, you can take turns whenever you want. All you need is an internet connection and a smidgen of time. At the time of writing, Storium has 36 hours left of its kickstarter campaign. I am a backer, a player and a narrator but have no other affiliation with the game or its publisher. To start a game in Storium, you can choose from one of the pre-populated stories or worlds. More are being added each day as the kickstarter campaign rumbles on. Each of these comes with a set of ready made plot elements including characters for the players to interact with, challenges for them to overcome and assets to help them along their way. These plot elements remind me of Fiasco playsets in that they suggest a framework for the story but do not dictate the plot. After that, enter the usernames or email addresses of people you want to join your game and invites will be sent out on your behalf. You can decide whether your game is open (and can be viewed by everyone on storium.com) or closed. New players can be added at any point during the game. Players create their characters by choosing cards to define who they are and what they can do. Firstly, they select a card that defines their background – similar to a class. Then they define their biggest strength and their biggest weakness. Players can either choose from the options available or make something up. Each strength / weakness can be used 3 times. In addition to the defined strength / weakness, players also get a wild strength / weakness which can be defined when played. Lastly, the player selects a calling which is like a starter plot. Characters, once defined, are submitted to the narrator for approval. The narrator can ask for revisions to be made or simply accept the character. Once play is under way, the narrator uses the various plot elements to construct scenes. 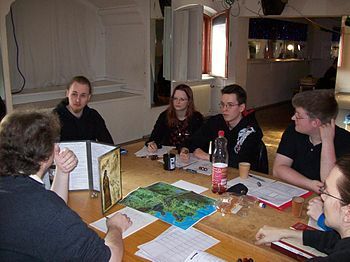 Using a location card, the players know where the action takes place. Character cards indicate who’s there. Asset cards show things that may be picked up. Challenge cards show difficulties that players must overcome to progress the story. Subplot cards can be picked up should characters feel motivated to solve them. Players take turns in any order and can make more than one turn at a time. They solve puzzles by playing their strength / weakness cards and describing what they do to overcome the challenge. The outcome depends on the combination of cards played. If all cards played are strength cards, then there is a strong outcome. All weakness cards means a weak outcome. If there is a combination of the two, then the outcome is uncertain. The player who plays the last card narrates what happens for a weak / strong outcome. For an uncertain outcome, the narrator decides what happens. Even when players describe the outcome, the narrator can request revisions if necessary. In between scenes, any players who are out of cards can refresh their hands and each player may only play 3 cards per scene which stops anyone from monopolising the story. Any player / narrator can make comments which appear in a commentary box beside the action. The game plays very well. In some ways, it helps if your players are in different time zones because each wakes up at a different time and the story rattles along. You can only get out of a game like this what you put in, but we have had an absolute blast and it means I can play games with friends on the opposite side of the world. It seems churlish to criticise a game like this because it does what it sets out to do very well. It would help if there were a more sophisticated way to browse ongoing games, maybe a search feature. There is no inbuilt combat or damage mechanism so it is difficult to simulate peril except through narrative. If you are into simulationist games, then you probably want to look elsewhere. If you love storytelling games and you are having trouble finding a game, then this is an absolute gem. Not to be missed.